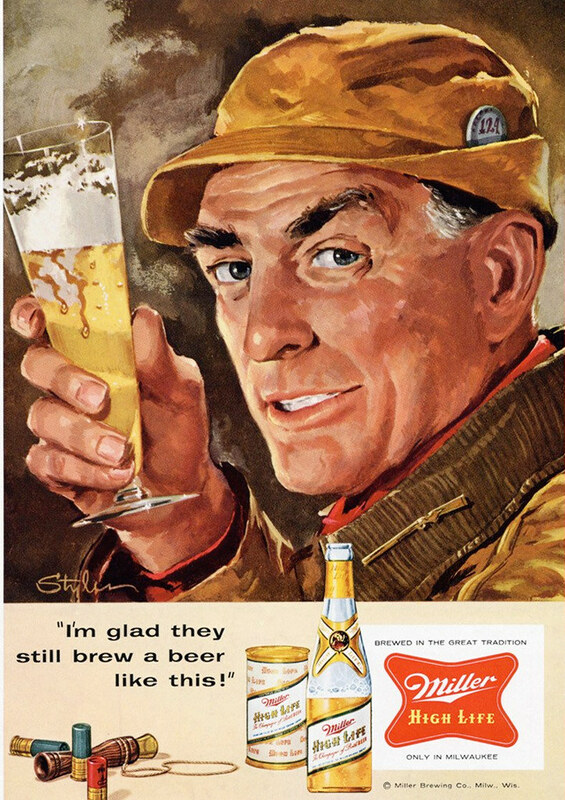 Saturday’s ad is for Miller Brewing, from 1958. This ad features a close-up illustration of a man holding a pilsner glass of beer wearing what appears to be hunting gear. The tagline below is “I’m glad they still brew a beer like this!” Below that sits three shotgun shells and a duck call, making clear that this is all about hunting. Born in Germany. Married Anna. 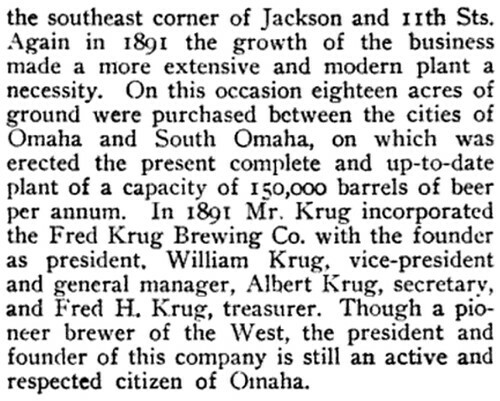 Came to Omaha in 1859 and became the pioneer brewer of Omaha with a brewery on Farnham between 10th and 11th Streets. 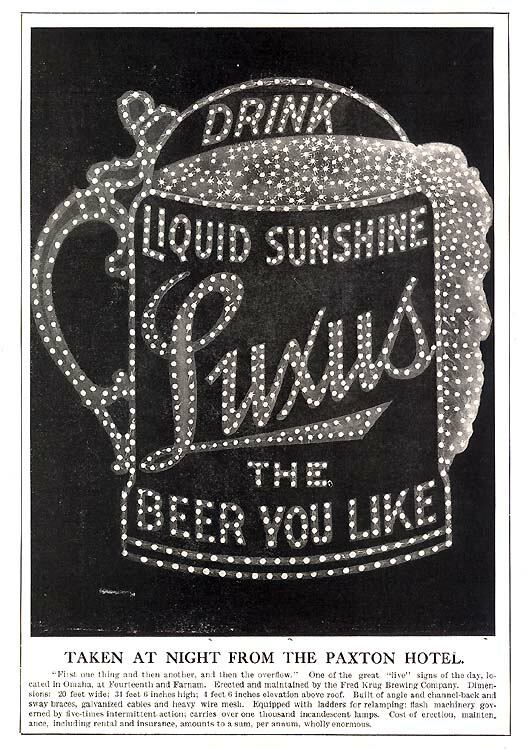 Partnered with Rudolph Selzer to form Krug & Selzer, and by 1860 became sole proprietor. In 1867 he moved it to 11th and Jackson and in the 1890’s he built a new brewery at 24th and Vinton Streets. Was on the Board of Directors of the German Savings Bank. Krug Park at 52nd and Maple Street and the Krug Theater were both named in his honor. Lived at 813 S. 20th Street and was a member of St. John’s german Evangelical Church. Fred Krug was born in Niederzwehren near Kassel in Germany on December 22, 1833. He lived in Niederzwehren until 19 years of age where he was trained as a brewer. He then emigrated to the U.S. in 1852, settling in St. Louis, Missouri. In St. Louis, he met his wife Anna and had a son, William. 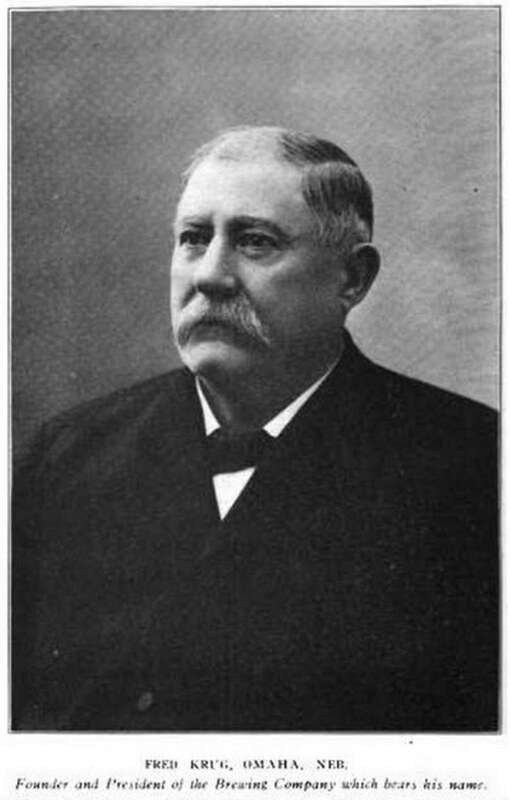 In 1858, he moved to Council Bluffs where he worked in a small brewery. Later the same year, he moved to Omaha with his wife and son. 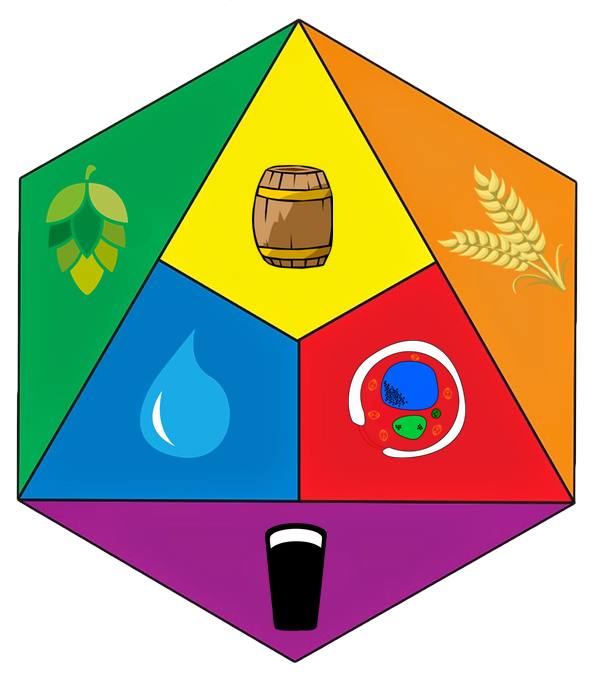 He established his first small brewery on Farnam Street. Later, his business moved to Jackson Street between 10th and 11th streets. 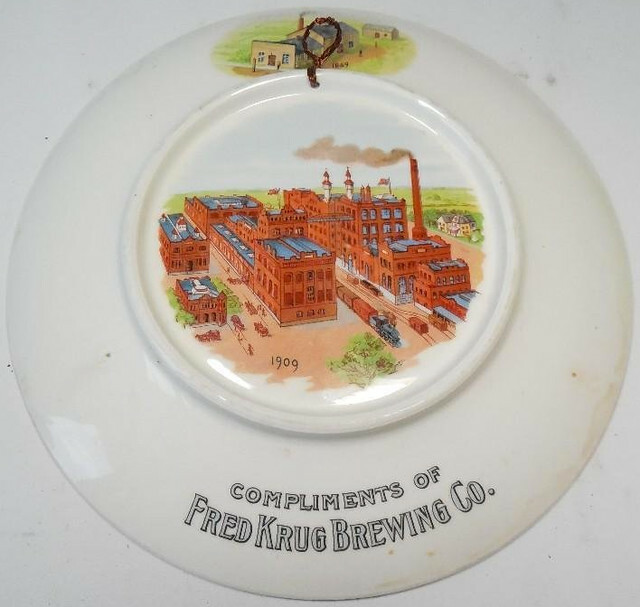 On October 17, 1893, he and his family celebrated the grand opening of the new Fred Krug Brewery. 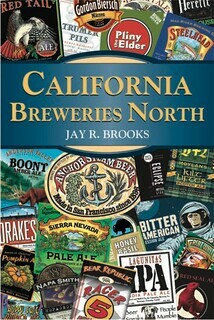 At the time this new brewery was one of the largest and most modern of its kind. Its capacity was reported to be 150,000 barrels per year and they employed approximately 500 men. 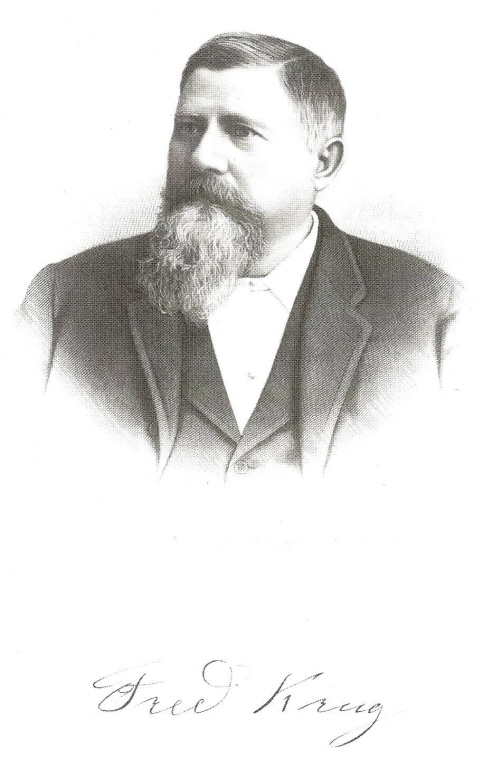 Krug led his company in Omaha for almost 50 years, and was responsible for founding Omaha’s Krug Park in 1904. The city of Omaha named a street after him. 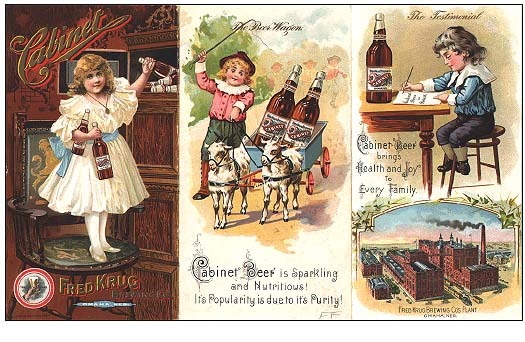 Frederick’s sons, including William, Frederick H., Jacob and Albert all worked at the brewery in a variety of capacities. 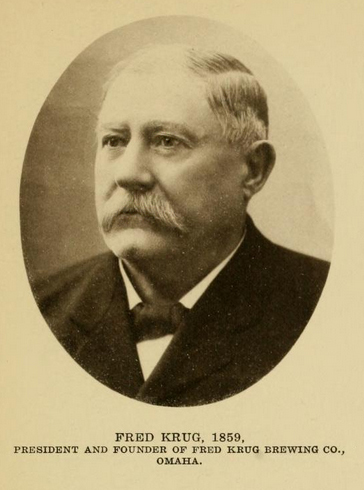 Krug, a German immigrant, served on the State of Nebraska’s Board of Immigration. 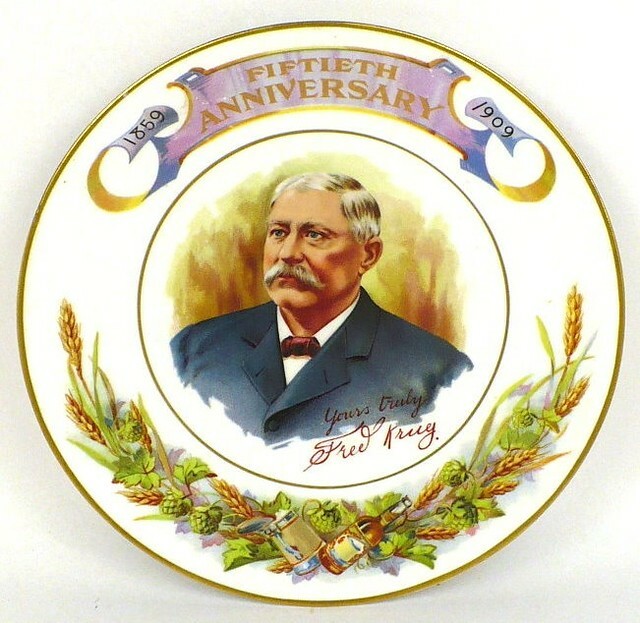 This is a commemorative plate created for the brewery’s 50th anniversary. And this is the back of the plate. 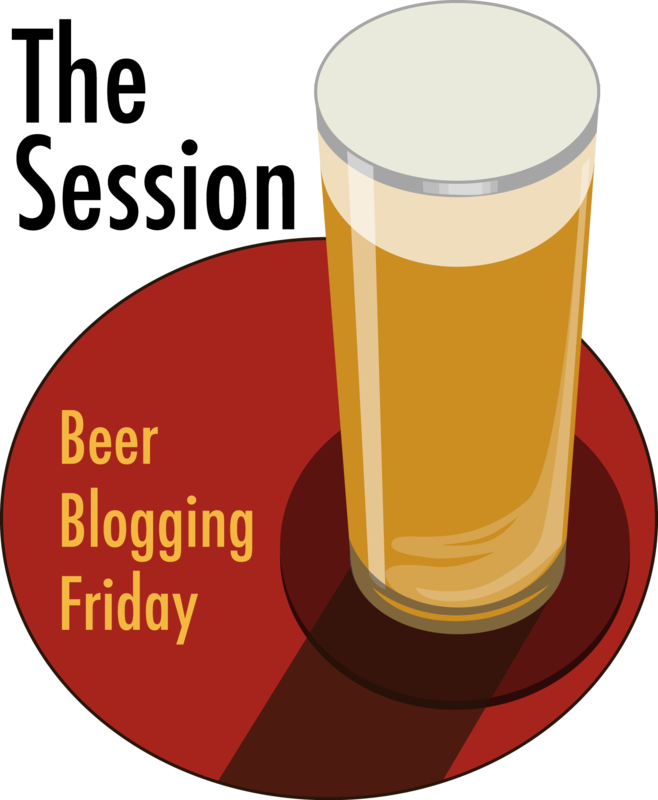 “The Fred Krug Brewery was located at 2435 Deer Park Boulevard in Omaha, Nebraska. 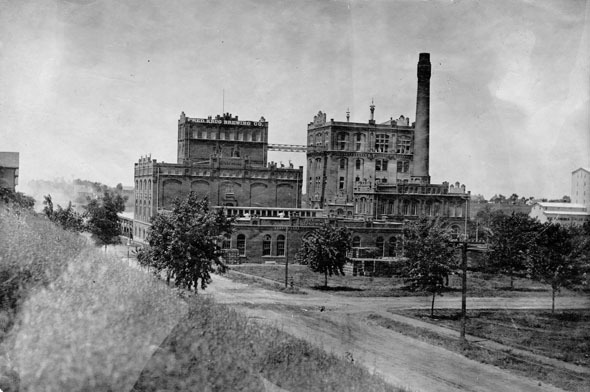 Founded in 1859, Krug Brewery was the first brewery in the city. 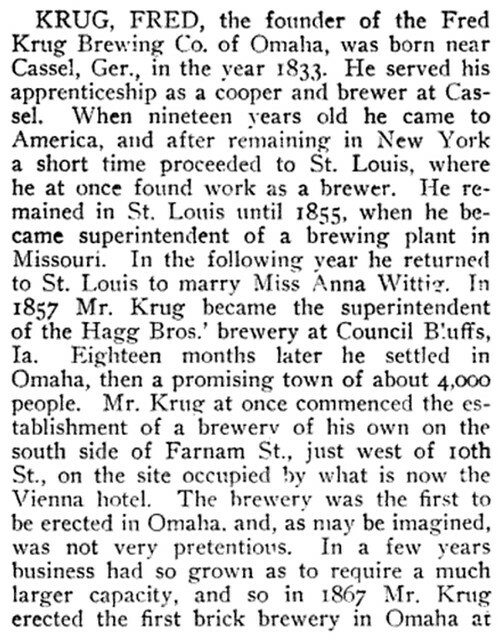 Krug was one of the “Big 4” brewers located in Omaha, which also included the Storz, Willow Springs and Metz breweries. Later sold to Falstaff in 1936, the facility closed in 1987. 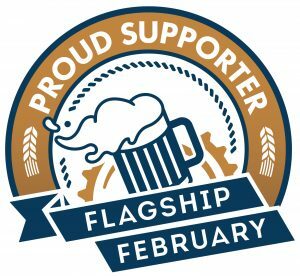 This is a short history of the brewery. In 1859 Frederick Krug established the Krug Brewery with an original output of one and a half barrels a day. In 1878 the brewery was located on Farnam between 10th & 11th Streets in Downtown Omaha, and by 1880 it was brewing approximately 25,000 barrels a year. 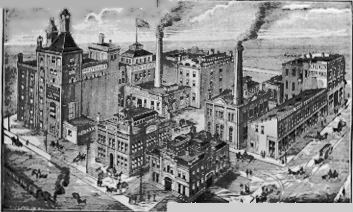 In 1894 the brewery moved to 29th & Vinton Street near South Omaha. It cost $750,000 and was reportedly one of the best equipped breweries in the country. Omaha’s historic Anheuser-Busch Beer Depot is the only remaining building from the original Krug Brewery. 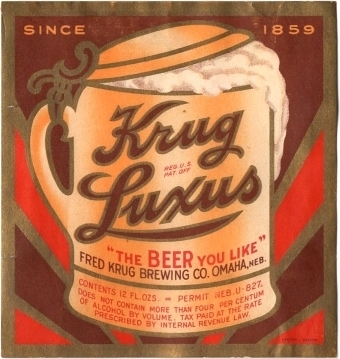 Krug brewed beer under several labels: Fred Krug, Cabinet, and Luxus. Krug supported an amateur baseball team called Luxus, taking them as far as the Amateur Baseball World Championship in 1915. Today is the birthday of Denise Jones, longtime brewer in the Bay Area. 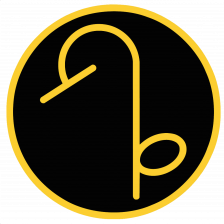 Until last year, Denise had started with a new brewery, Napa Point Brewing before it closed, but brewed for long stints at Moylan’s and Third Street Aleworks, among others. More recently she’s moved to Bamberg, Germany and is working with Weyermann. She’s a very talented brewer, and makes especially great stouts. Join me in wishing Denise a very happy birthday. 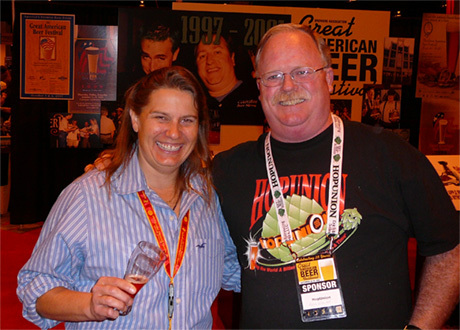 With Ralph Woodall of HopUnion at GABF in 2006. 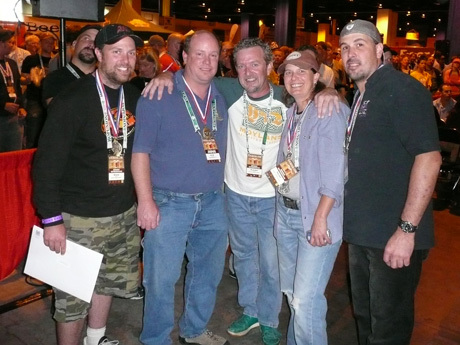 Shane Aldrich and Arne Johnson, from Marin Brewing, Brendan Moylan, who owns both, and Denise, along with Jim Grbac, from Molyan’s Brewing after the award ceremonies at GABF in 2007. 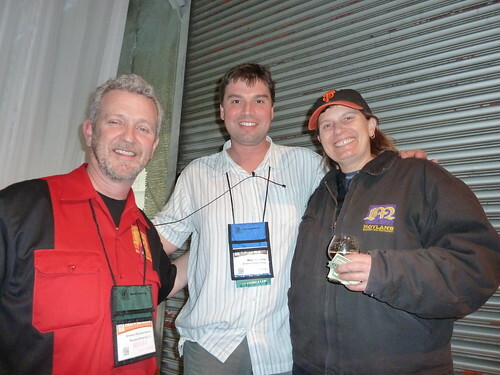 Denise with Brendan Moylan and Mark Worona, from Brewers Supply Group, at Tcho Chocolate in 2012 after a chocolate beer competition during CBC (which Denise won). 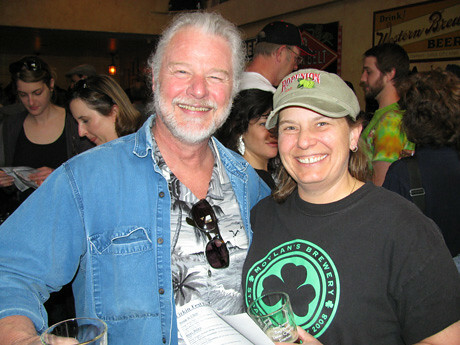 With Alec Moss at the Triple Rock Firkin Fest in 2009.